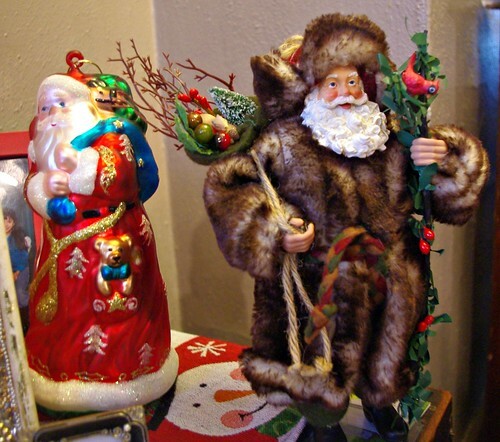 St. Nicholas was a real person and in fact a real bishop! You can read his story here. The story of Nicholas's conception is bible-like. His parents, Theophanes and Noona prayed for many years to have a baby. Finally, in despair, Noona poured out her hear to the Lord, just as Hannah did in the Old Testament. Her prayers were answered and little Nicholas was born in the year 280 AD in the village of Patara (in Turkey). Legend has it that even as a baby he could do miraculous things. It is said that he once stood up in his baby bath and raised his little chubby arms in prayer! His parents were wealthy and raised their son as a Christian. When Nicholas was a young man, his parents succumbed to an epidemic. He was subsequently raised by his uncle who was the bishop of Patara who educated him. He used his inheritance to take care of the sick and poor. 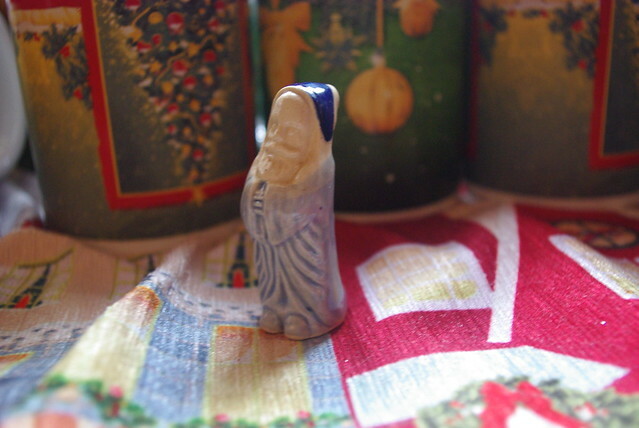 It is probably during this time that one of the most famous stories about the saint happened. A poor family in the village did not have enough money to provide dowries for the three daughters. Nicholas anonymously threw bags of gold up through the chimney of their house which landed in the daughter's shoes. The girls were able to get married, but Nicholas was unable to remain anonymous. Word of his generosity spread. With is fortune exhausted, Nicholas entered the priesthood. During his studies, he made a trip to the Holy Lands. A huge storm came out that frightened even the most seasoned sailors. When most on board were certain that the ship would be lost, Nicholas knelt in prayer and asked God to spare them all because he was just starting out and had so much more work to do for the Lord. Immediately the storm calmed. Eventually, Nicholas was ordained and came back to his town of Patara where he molded his priesthood under the writings of St. Polycarp. The people loved him and he was known for his holiness and kindness. When the bishop of Myra passed away, there was some confusion about who should become the next Bishop. The bishops of the region gathered to choose the new bishop but could not come to an agreement. Finally, one of the older bishops suggested that whoever came through the doors after morning prayer named Nicholas, would be the next bishop. Nicholas was in town to pay his respects to the deceased bishop. He opened the door and came in and was immediately named the new Bishop of Myra! Unfortunately, this was during the time of Diocletian, the emperor who had martyred and persecuted so many of the early saints. Nicholas was captured and imprisoned for many years. While in prison he continued to minister to the other prisoners and keep the faith alive, performing the duties of a bishop as best he could from a prison cell. Nicholas attended the Council of Nicaea in 325. He died on December 6, 343 AD. It's clear that Nicholas was a courageous and loving bishop. I can't imagine that he would have remained silent while a woman in his diocese was publicly starved to death, or that he would have sat by while civil leaders verbally condone the killing of innocents while receiving our Lord in the Eucharist with the same mouths. I think there is much to learn today from the strength and bravery of a saint such as Nicholas. Gleaners of the golden grain. And dewy shadows swept along. Lodge us till the morning light." I can find a place for all." And did the little creatures slay. In pieces small as they were swine. His way did to the forest wend. "Butcher! I would rest me here!" You are welcome, St. Nicholas! There's place for you the night to pass." He would the supper board was laid. "Will you have of ham a slice?" "I will not, for it is not nice!" "Of this veal you'll take a bit?" "No! I do not relish it." For seven long years have laid in brine!" And forthwith from the portal fled. Repent and God will pardon thee!" And lo! he placed three fingers there. The first one said, "I sweetly rest!" The second said, "I too am blest!" In Paradise I seem to be!" 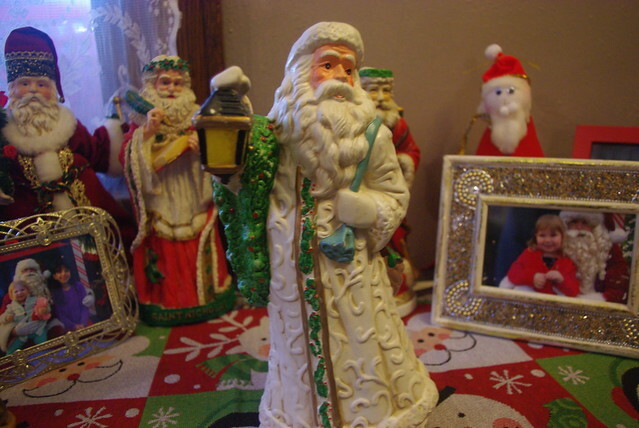 I really like to give my children a truer look at the lives of the saints and The Legend of Saint Nicholas doesn't sugar coat it! 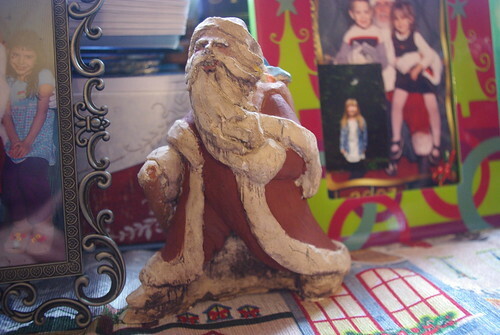 I have somewhat of a collection of St. Nicholas things that I have saved over the years. This is a beautiful throw that I purchased at a tag sale at a great price, and it adorns our couch in the living room during the Advent and Christmas Season. and also my mega Advent links page! 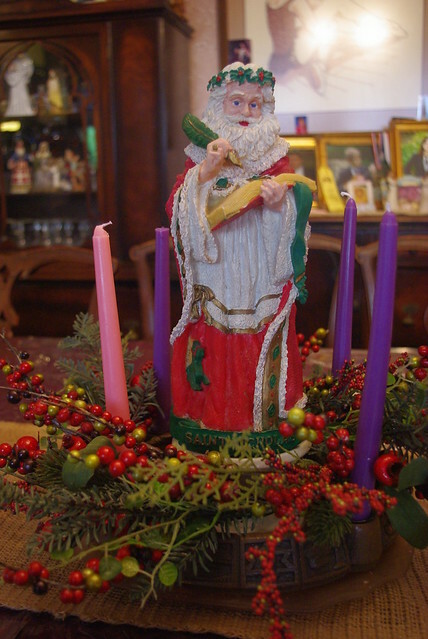 A few years ago we made a St. Nicholas Spoon Saint! 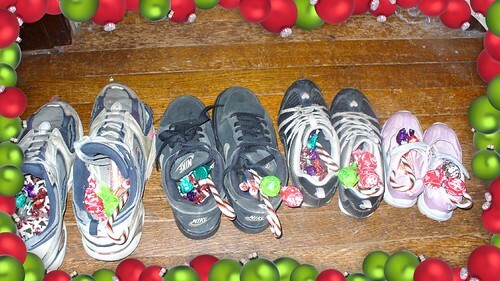 It is our tradition to have the kids put their shoes out on the eve of the Feast of St. Nicholas. One year we did NOT fill shoes with candy on the eve of the feast. Mr. Pete worked very late and was working all the next day although the kids put their shoes out, they are not getting filled until the night of the feast. I write this as a way of saying it's okay to live the liturgical life, but with family and work responsibilities, it's also okay to be flexible in our celebrations from day to day and from year to year! 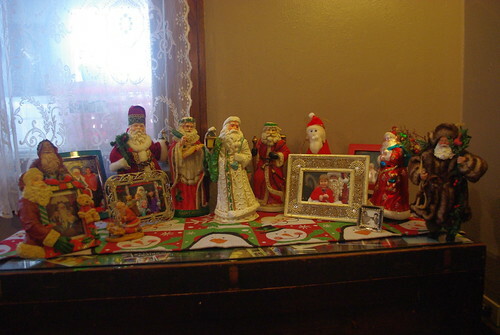 Our assorted St. Nicholas statues come out today. 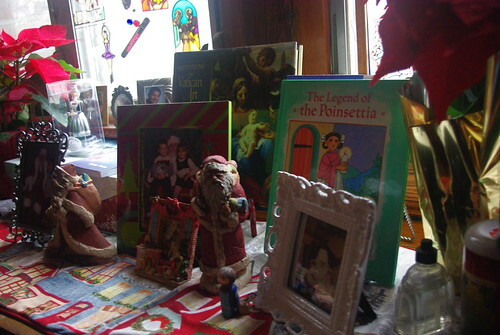 A few of these were bought at craft shows, one was a gift, but most came from yard and estate sales. 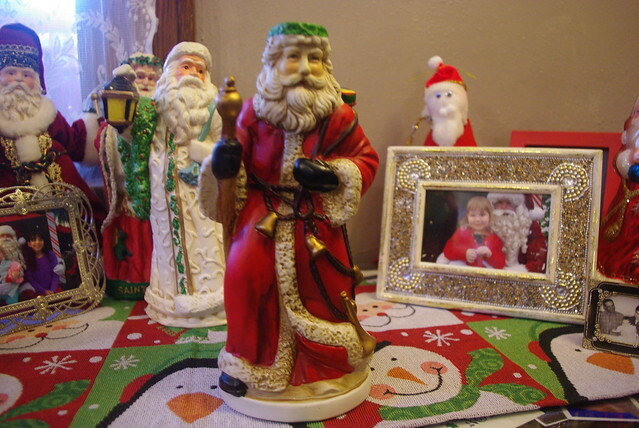 I also put out photos of my kids with santa. This is my newest addition. I got it at an estate sale for $5. It's also a music box! 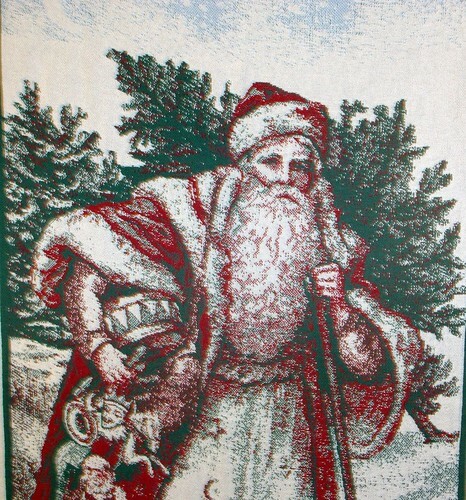 And a Santa unique to Akron - the Blue Santa. You can read more about that here. As is our tradition to have the kids put their shoes out on the eve of the Feast of St. Nicholas. One year we did NOT fill shoes with candy on the eve of the feast. Mr. Pete worked very late and and was working all the next day although the kids put their shoes out, they are not getting filled until the night of the feast. I write this as a way of saying it's okay to live the liturgical life, but with family and work responsibilities, it's also okay to be flexible in our celebrations from day to day and from year to year! 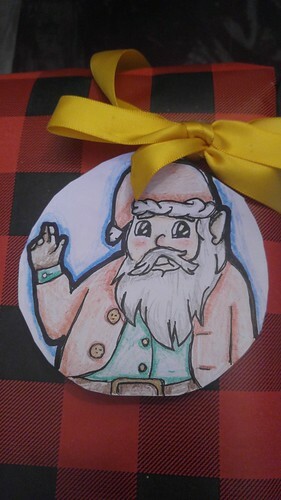 Get your free St. Nicholas Day Gift tags by joining my newsletter. !